Rated PG for Positively Good. 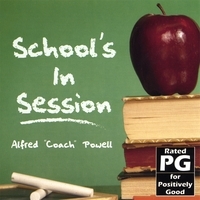 Teachers and Students will Love this CD. OH my God what a timely Cd. This should be in every student hands. I love it especially "Pull your pants up" and "Weed". Coach keep up the great work our children need this. This CD was a blessing to my daughter. When we first listened to the CD my daughter couldnot get enough. I thank God for people like Coach that keep our kids inspired to do better in school and in life. Hats off to you Coach Powell,and keep up the GREAT work. Looking forward to more great things from you in the future. Its offical, Toledo, Ohio is on board we support and love "Schools In Session". You guys really hit the mark with this one, this is going to be huge. Man "Weed" is the truth, you made me and my crew think on this one, I can only speak for myself this cd has given me ways to say no to a bunch of stuff my friends and I do. Thanks Coach for giving me a way out. We need you here in Detroit, MI please hurry back. You know you've got a hit when kids are ranting and raving. One teacher in Chicago plays the opening tune at the beginning of the school day. She said her students love all the songs. The boys especially love Pull Your Pants Up. Keep up the great work, Coach Powell! This turns the popularly held association between hip hop music and negative imagery on its head. This album proves that, in the hands of talented artists, the music communicates to the core whatever you let it. Thank goodness Coach Powell bothered to show us that. This is not only fun – it’s necessary. Let me say you're a man on a mission. Thank you for this song I use it to remind my students and my own children what there real mission is!!!!!!!!!!! Please hurry back to Atlanta, GA we need you! This CD is excellent a must buy. Great motivational album for kids. Just in love with the Album Coach keep doing your thing. Wow! This cd is a must have. If one really wants to be the teacher of the year have this cd in your classroom. This cd is so motivating and powerful that all age groups can enjoy it. I listen to it every morning on my way to work.